Cliff became a member of the AKA in 1992. His first convention was at Wildwood New Jersey in 1996. After being hooked into kite flying, Cliff asked his wife to sew a kite or two for him. She did and then told him to learn to sew. He did and now is an avid kite maker and an excellent teacher. 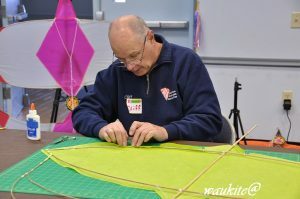 Cliff has done many workshops and has taught kite making at several places including Fort Worden Kitemakers Conference, several times. 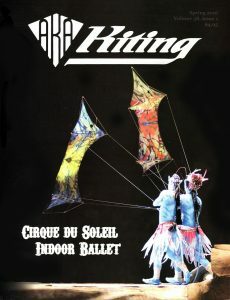 Cliff has also taught a workshop in England for the White Horse Kite Flyers. Cliff has taught children’s workshops and for the past two years has been involved with the Ronald McDonald’s camp for children with cancer and other serious illnesses. This has become a passion for him and he is looking forward to next years camp. Cliff has been our AKA treasurer for the past two years. He has also joined in with representing the AKA in Dieppe France, working in the AKA booth and also doing the kid’s kite making there. While in Dieppe he also did a work shop at a local school. With all of the above qualities and being a great friend, I am most impressed with his passion for the kids kites and doing the work shops. This takes a special talent and he has it. Out of the workshops that he does there has to be some future AKA members. What else can I say….well that he even taught a blind teenage boy to make a kite this summer. He is an excellent representative for kiting and the AKA. I think that Robert Ingraham would be proud that Cliff Quinn would receive this award. David Robinson Secretary for The White Horse Kiteflyers.